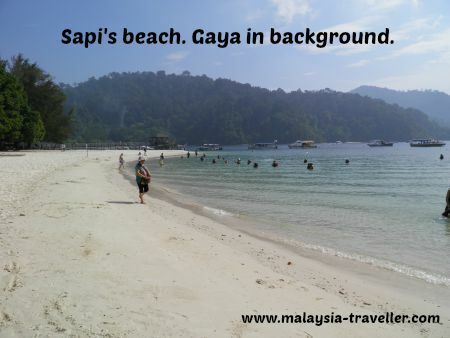 Sapi Island is one of the most popular places in Sabah to swim, snorkel and relax and it is just 20 minutes boat ride away from Kota Kinabalu. 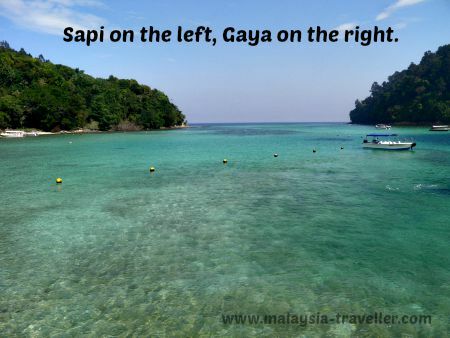 Sapi is one of the five islands making up the Tunku Abdul Rahman Marine Park, a national park established in 1974 covering 50 sq km of the islands and their surrounding reefs. Pulau Gaya, the largest at 15 sq km and with a highest point of 300m above sea level. It is mostly thick with primary forest. Tourists are largely confined to three luxury beach resorts or restricted to organised walks on the 20km of marked trails. Unfortunately the eastern end of the island is fringed with a squatter community of 6000 or so undocumented, largely Filipino, migrants living in ramshackle stilt houses with poor sanitation and garbage disposal. While this settlement, considered illegal, provides Kota Kinabalu with much needed labour, it is a high crime zone and a no-go area for locals and tourists. The authorities would like to relocate this community to maximise the excellent tourism potential of this island which is, after all, supposed to be in a protected marine park. 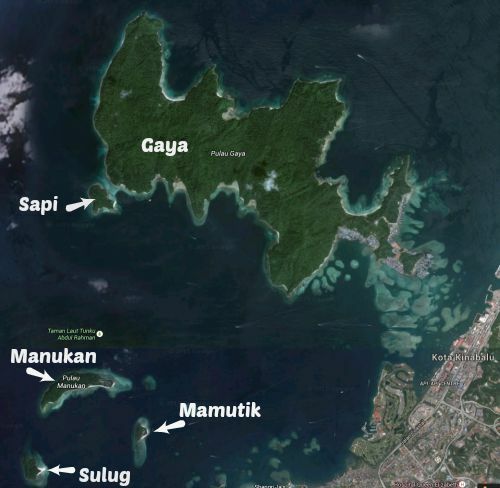 Pulau Manukan, the second biggest and most developed with the Park Headquarters and accommodation. Pulau Mamutik, is thought to have the best snorkelling and is a renowned dive site for novice divers with its shallow water and gentle currents. 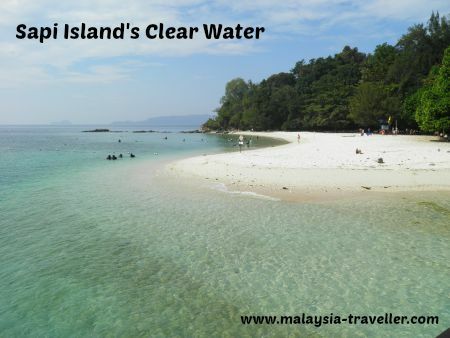 Pulau Sulug, the most unspoilt and remote island with a long sand spit and an extensive coral reef. Swimming. Pristine white beach and clear water. Snorkelling. The fish here are accustomed to being hand fed so they will come to you. You can buy fish food on the island. Picnic Spots. There is plenty of shade with seating and tables. However the island does get crowded, especially at weekends. On my last visit I was there with boat loads of tourists from China who had lunch provided. Diving. There is a coral garden at the southeast tip of the island. Stingrays, cuttlefish and moray eels are among the marine life found here. Good place for beginners. Walk to Gaya Island. At low tide it is possible to walk across the sand bar connecting to Gaya though you need to take care not to get cut off. Scuba-Doo Breathing Observation Bubbles. Motorbike-style mini-submarines are available for hire enabling you to enjoy a scuba diving-like experience while breathing normally in a safe air bubble. Nature Trail. There is a 5 km trail which skirts the island and takes you up to its highest point. On the way you can find a small deserted beach if you want to escape the crowds. If you have shoes with you other than flip-flops it is best to wear them while walking the trail. Monitor Lizards. One of the island’s most popular attractions is the presence of giant (2m long) monitor lizards who like to scavenge from litter bins and are not at all afraid of humans. I nearly trod on one when I was not looking where I was going! These are wild creatures with sharp claws and a nasty bite and you should keep your distance when taking photos. Macaques. These monkeys are cute to look at but are a bit of a pest, especially if they steal your bag or camera. Better not to feed them. 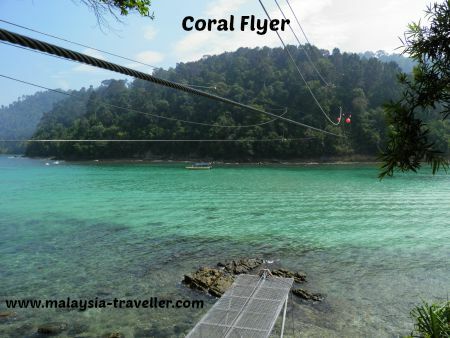 The coolest attraction on Sapi Island is probably the Coral Flyer which claims to be the longest island-to-island zipline in the world. This flying fox (aerial ropeway) links Sapi to Gaya Island, a distance of 250m at speeds of up to 60 kph. This is a professionally managed operation with safety in mind. Trained and qualified personnel and strong harnesses and cables ensure a smooth trip. Unless you weigh over 10 tons you should be OK! 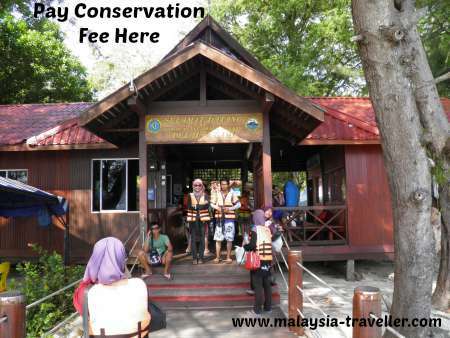 Ticket Cost is RM 64 and includes a boat transfer to Gaya and return journey by zipline. The ride is open from 10am to 3pm. You can buy tickets on arrival at the Sapi jetty. On my last visit to Sapi Island there were two or three armed policemen stationed on the beach for the protection of tourists. There have been no serious incidents on this coast of Sabah but being not far from the pirate and terrorist infested waters of the Sulu Sea, this is a sensible precaution which can make us feel more secure. 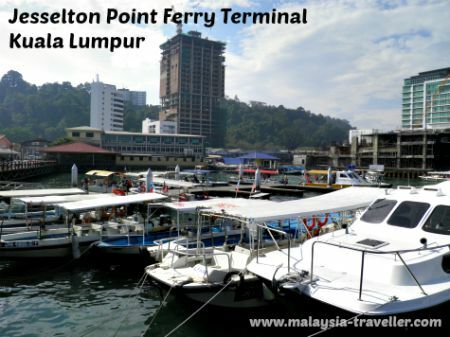 There is a ferry terminal at Jesselton Point Waterfront in Kota Kinabalu with numerous operators providing speed boat return trips to the islands of the Tunku Abdul Rahman Marine Park at fixed prices. The boat ride can be bumpy. Boats start at 7:30am and last return departs at 4pm. When buying the ticket you specify what time you want to be picked up. Allow some spare time in case the boat is delayed by bad weather or unreliable driver (they are mostly reliable). Only buy tickets from the ferry terminal counters and avoid any unauthorised cowboys. Single island return (to Sapi, Manukan, Mamutik or Sulug): RM23 adult / RM 18 child (below 11). In addition to the ferry fare, all passengers must pay a Terminal Fee (including GST): RM 7.63 adult / RM 3.80 child. For the less popular destinations (Gaya and Sulug), the operators may have difficulty filling a boat and will ask you to charter the whole boat instead for RM200. It depends on the demand on the day. RM 3 adult / RM 1 child (for Malaysians). 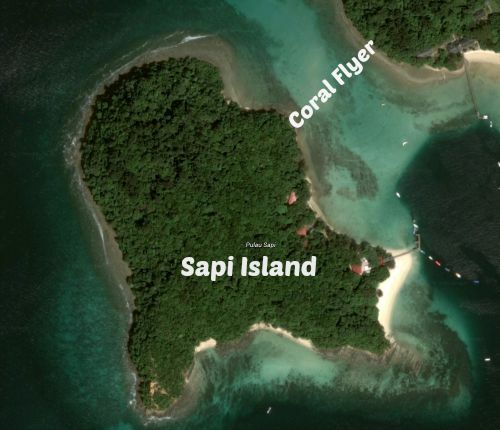 Personally I think half a day on Sapi is sufficient. If you want to spend a whole day out why not take the island hopping options instead. 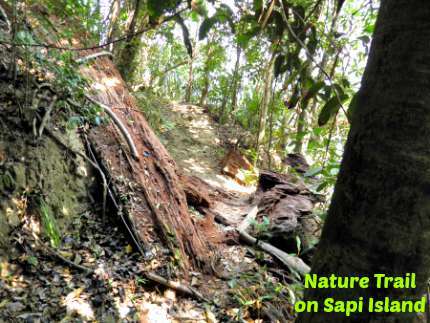 There is no accommodation on Sapi Island itself but camping is permitted with prior permission of the Park Warden at the jetty. On Manukan Island: The Manukan Island Resort (4 stars). Gaya Eco Resort (5 stars). Bunga Raya Island Resort (5 stars). 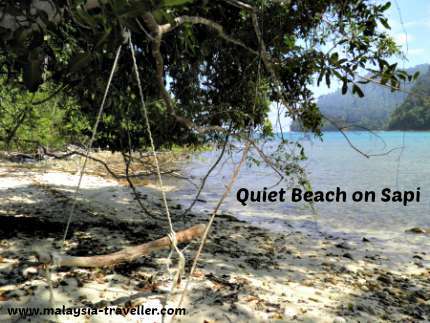 Located on legendary Police Bay, thought to be one of Malaysia’s finest beaches. Gaya Island Resort (5 stars).